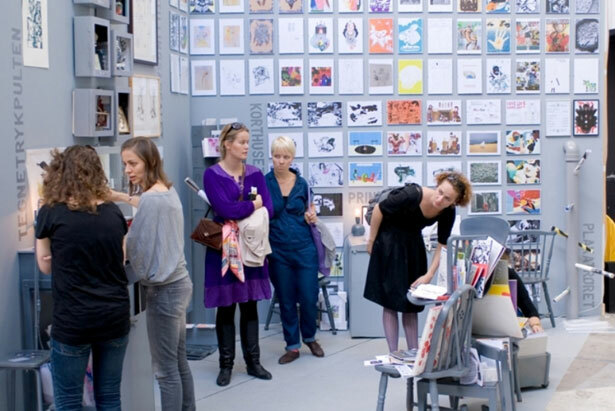 For the fifth year in a row, Alt_Cph – Copenhagen Alternative Art Fair – is ready to kick off the alternative art scene, which is self-organised and handled by the artists. With a host of activities, Alt_Cph will join together the otherwise widely spread art scene. Besides participants from Scandinavia, this year will also feature participants from amongst others New York, Hamburg and Beograd. Since the beginning, Alt_Cph has been devoted to uniting and strengthening awareness of the self-organised and non-commercial exhibitions. The fair wishes to be a platform where a dialogue can be created. Art has a value of its own, which in other words means that the participating artists and galleries are not interested in defining art based on market value or as a product. Thus, Alt_Cph to a large extent offers art experiences that are not for sale. All participants, exhibition stands and artists contribute with each their own project. The large factory hall and the area around The Factory for Art and Design will be opened up and will be formed by the participants’ wide-ranging projects. Skup Palet will be moved into the hall featuring a third grade from Naur-Sir in Western Jutland. During the class lessons, the blackboard, the school bag, pencils in a pencil case and the children’s’ expectations will be an illustration of how the first years in school are formative and how society creates and is created through collective knowledge. Biro Beograd invites everyone to play along in their project, Belgrade Park: Play De(Con)Structive! Biro Beograd points out how the play has a significant role in our cognitive development and that the play can help opening up new spaces and potentials for action. Flux Factory, which is based in New York, participates with a tattoo shop, Galleria Huuto opens a Detox Tea bar, while Skånes Konstförening serves a dinner with A Culinary Performance in Three Chapters, during which The Bubble Girls will serve champagne while giving advice on life and love. With The Artist as an Image Spark presents a number of young Danish art photographers in a “dynamic mosaic of photographic pictures”. Formverk (art zone) contributes with photo and video installation in Folklore Studies, while both Gallery Crymo and Studio44 create collective installations. The collective and communicating is thematised by Spanien 19C, where Kiosk creates a flexible room that changes with the participation of the user. The collective and communicating is also the focal point for Danske Grafikeres Hus in Bulletin Board where the bulletin board can be interpreted as a so-called “mindmap” or a snapshot of thought processes. Juhana Moisander relates to the Factory’s previous history as laundry for Sundholm with the video installation Cleaning Lady, and Camilla Nørgård participates with the creation Make your own institution. This year, all participants at Alt_Cph have been invited to relate to two overall themes. The first is the self-organised art scene, while the other subject, gentrification, discusses the role of the art in relation to urban development. In Hamburg, artists and cultural work have joined forces in the initiative Gängeviertel and have created a debate and influence. Gängeviertel is participating at the fair with a presentation of their initiative. Throughout recent years, Marianne Jørgensen has worked with the comprehensive project love alley, which discusses development of peripheral urban areas. The project, relating to and imitating building processes, is presented at Alt_Cph 10. A number of exhibition stands and artists have moved their projects to the area around the Factory. Koh-i-noor has invited Javier Tapia to participate with the project A Platform Proposal, which discusses the platform as a concept, while the platform at the same time being realised as a sculptural structure featuring 25 m2 and three floors, which gives room for both meeting in the collective space as well as withdrawal and reflection. Galleri 69 has moved into a shop and invites everyone to participate in a decoration project in an inclusive atmosphere. It also calls for slowing down and taking a stroll in the area: Mette Kit Jensen has explored the area around the Factory and planned a route for the audience based on the story of a homeless woman. YNKB relates directly to the local area with the project Suppe til September and serves soup made of locally grown ingredients and supported financially by Områdeløft. Rumkammerat offers storytelling via text messages in their caravan and also contributes with farve-fabelade, an interactive wall painting. In the cottage tent in the Factory’s backyard, torpedo18 invites everyone to an art competition, where the task is to create a piece that is not easily accessible. The winner project will be realised and published on torpedo1’s website. Texts by Jeanne Starum, Signe Vad, Maibritt Pedersen, Camilla Nørgård, the participating exhibition spaces and artists. Participates with a book shop and publications from independent and minor publishing companies. Check In, Swim Out: A Floating Hotel as Art By MELENA RYZIK Read the original here.